Aluminium Industrial serial plates, measuring 75mm x 50mm x 0.5mm and supplied with bur-free straight edges. Ideally suited for interior use our low cost serial plates are ideal for adding your company details to any equipment supplied. Printed in spot or full colour which can incorporate your own logo and company details, supplied in numerous finishes, and with either a self adhesive backing or holes for screw/pot rivet fixings. For safety issues, corner radius is also available. 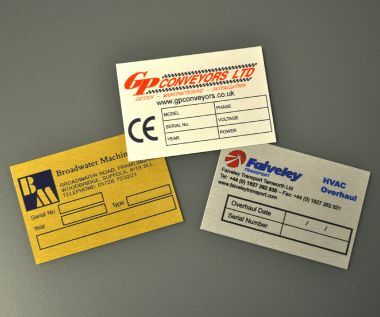 Variable Serial Numbers can also be added at an additional cost. Aluminium Dye Sub ID Serial Plates can be supplied with 2 or 4 x 3mm fixing holes, self-adhesive or without any fixings.